After many years working in various roles in the Melbourne beer world, the man we once referred to as the Mozart of Aussie beer (due to his combination of ridiculous depth of knowledge on beer and ridiculously young age) is now brewing at Two Birds. And, having impressed friends and peers in the industry in the past with tiny trial batches, Wilson Hede has now been given his head and asked to create a beer for commercial release. The Wolf refers to a bunch of things: his penchant for wearing a wolf-covered vest; the direct translation of the Latin name for hops. 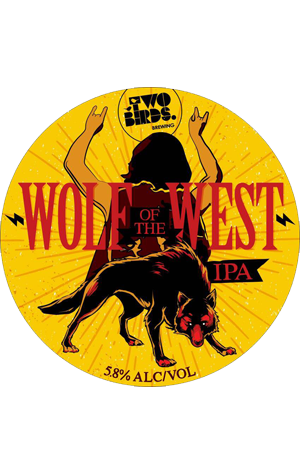 The West is obvious: Two Birds brews in Melbourne's west. As for the beer, he's gone after a lean, tight and dry West Coast style IPA, one that we're yet to taste but which various people we know who have tasted it have described using various combinations of pine, piney, tight, piney, clean, piney, tight, pine, dry, lean and piney. It's pale and all about the hops and is on tap at the Two Birds Nest for a week or so before cropping up on tap elsewhere.